Thomas C. Carter is a near lifelong northern Virginian. He graduated from the Marshall-Wythe School of Law at the College of William and Mary in Williamsburg, Virginia. He was admitted to the Virginia State Bar in 1978 and was appointed to a position as a law clerk to the Circuit Court Judges of Fairfax County. 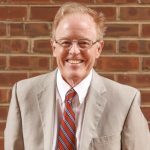 In 1980, he was sworn in as an Assistant Commonwealth’s Attorney for the City of Alexandria. During his five years in the Commonwealth’s Attorney’s Office, he tried many criminal and traffic cases, both felonies and misdemeanors, jury and non-jury trials. Since 1985, he has been in private practice concentrating on criminal and traffic matters. Mr. Carter has lectured extensively on criminal and traffic defense. Recently, he has been a guest speaker at Alexandria and Fairfax Bar Association Continuing Legal Education seminars. He is always willing to help lawyers less familiar with northern Virginia state and federal practice. Since 1978, attorney Thomas C. Carter has been helping the people of Virginia resolve their criminal and traffic offenses in both state and federal courts. Mr. Carter has an AV® rating in the Commonwealth of Virginia from Martindale-Hubbell, the highest rating possible.